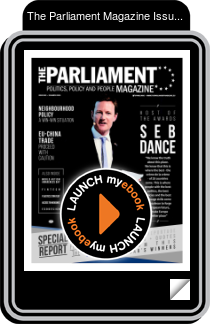 The host of this year's Parliament Magazine MEP Awards Seb Dance graces this issue's cover as we report on a night that saw emotion, laughter and well-deserved praise and recognition of the outsatnding work that MEPs have undertaken over the 2014-19 legislative term. Also inside, Portuguese deputy José Inácio Faria highlights why he believes that Europe's shortage of inexpensive essential medicines is a problem that requires an EU solution. The newest member of the Parliament Mag team, Lorna Hutchinson brings her wealth of knowledge to a three-page feature on World Autism Awarenes Day where she talks to campaigning Maltese MEPs Miriam Dalli and Marlene Mizzi as well as Autism-Europe Director Aurélie Baranger on what needs to be done to raise awareness and improve support. European Commissioner for Neighbourhood Policy and Enlargement Negotiations, Johannes Hahn discusses why he believes that despite the challenges, the Western Balkans are a win-win opportunity for the EU, while the chair of Parliament's Foreign Affairs Committee. David McAllister echoes Hahn, arguing that the Western Balkans must remain a clear political priority for the EU. MEPs David Martin and Iuliu Winkler contribute long-reads on EU-China trade relations, while French deputy Alain Cadec and EESC member Daniel Mareels discuss the opportunities that FinTech can offer. Plus comment and analysis from MEPs Thomas Mann on freedom of religion in China, István Ujhelyi on why he believes Viktor Orbán is Russai's number one mouthpiece, Barbara Lochbihler on why the EU must continue applying pressure on human rights against Iran. Our new In Conversation With interview features FEDARENE president Julije Domacon, while this issue's event coverage pages look at how the challenges and opportunities facing the PET plastics industry in recycling waste material. We also have MEP Francesc Gambús on why more work still needs to be done on the EU's Ecodesign Directive. Finally, in our 5 Questions With... column, find out how John F. Kennedy had a major impact on a then 14-year old Eleni Theocharous.